SALT LAKE CITY — Utah football fended off a late rally and defeated Colorado, 20-14, in the regular-season finale for both teams on Saturday afternoon at Rice-Eccles Stadium. The Ute defense forced four turnovers, intercepting three passes and creating a fumble, while also producing six sacks, four from Viliseni Fauonuku. Utah held Colorado to just 49 yards rushing, 28 through the first three quarters. The Buffaloes were 1-3 in the red zone and also had a field goal blocked by Ute defensive end Kylie Fitts. Marcus Williams had his team-leading fifth interception in the first quarter while Cory Butler-Byrd added another later in the half. Gionni Paul had his fourth pick of the season in the third quarter and led Utah with 13 tackles. The offensive star for the Utes was running back Joe Williams who ran for a career-high 187 yards (34 carries) and scored his first career touchdown. Colorado started the game by driving down the field before Fitts’ block of a 31-yard field goal by CU’s Zane Gonzalez. The Utes answered with a 13-play, 80-yard drive that was capped by a Travis Wilson 16-yard touchdown pass to Kenneth Scott. Wilson would eventually surpass the 2,000-yard mark for the season with 108 yards passing. Scott finished with three catches for a team-high 31 yards and his fourth touchdown reception of the year. After a Ute fumble, Colorado could not capitalize and coughed it up themselves, turning the ball over at the Utah 44-yard line on a fourth-down play. Andy Phillips’ first field goal of the day pushed the lead to double digits in the second quarter, 10-0. Colorado went three-and-out but a fumble on the punt return gave the ball back to the visitors. Cade Aspay threw a 28-yard strike to Nelson Spruce to get Colorado on the scoreboard and cut the deficit to 10-7 at the halftime break. The Utes opened the second half with an effective 13-play, 68-yard drive that culminated in a Williams scamper from five yards out. Paul intercepted the very first offensive play for Colorado on its next possession and Phillips booted his second field goal of the day for a 20-7 Utah lead. Phillips is 13-for-13 on field goals under 40 yards and has 10-straight makes. Colorado pulled within a possession with 4:13 remaining in regulation when Jordan Gehrke connected with Phillip Lindsay in the flat for a 16-yard touchdown. 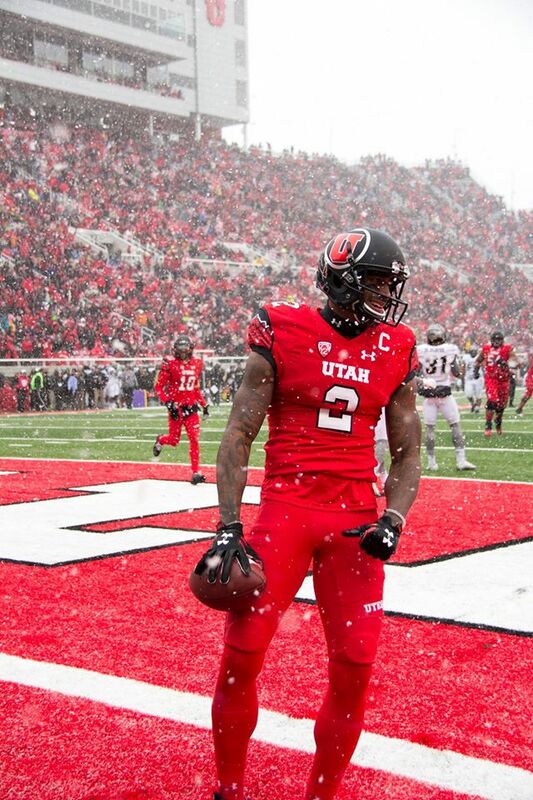 After a three-and-out, Utah was forced to punt which set up a frantic final two minutes. Colorado moved the ball into Utah territory but Fauonuku stripped Gehrke and Jared Norris came up with the recovery. Utah finishes the regular season with a 9-3 record, 6-3 in the Pac-12 and tied for a share of the Pac-12 South. Nine wins ties for the most Utah has had since joining the Pac-12 (9-4 in 2014) and six conference victories is the most that the Utes have had in Pac-12 play. Utah will now wait and see which bowl it will be selected to play in with announcements being made next Sunday, Dec. 6.